Unruly cats are a danger, and while controlling them is never easy, there is something that can help. Cat muzzles can help protect the handler of an aggressive cat from bites, though they are not 100% protection. Aspen Cat Muzzles come in three different sizes, and finding the right size is the key. They can be a useful tool, but require some caution, depending on the level of aggression of the cat. What is a cat muzzle? A cat muzzle is a device that goes around a cats face used to prevent them from biting. It is primarily used in veterinary hospitals to prevent cats from biting when they are in pain or when they acting aggressive. For people at home, muzzling a cat can be a very difficult thing to do. Cats typically do not like things on their face and will try to paw it off as soon as the muzzle was placed on. There are commercially available cat muzzles that prevent the cat from biting. The best type of cat muzzle is one that covers the eyes as well as the mouth. This can sometimes calm the cat if he/she cannot see. Muzzles are only for temporary use and you must watch your cat closely and be ready to remove the muzzle immediately if the cat starts to vomit or has difficulty breathing. A cat muzzle can be a part of a first aid kit for cats or something to carry in your trunk along with a towel and a cat carrier. 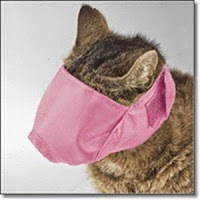 A cat muzzle can come in very handy if you happen upon an injured cat that is in pain in order to take him for help. If you are looking to buy a cat muzzle, buy the type that does cover the eyes as this can be soothing. The style that is nylon, machine washable, with an adjustable Velcro closure seems to work very well. It should also have a good hole by the snout area that allows your cat to breath. After you place the cat muzzle on a cat, make sure the nostrils can be seen, and thus your cat can breathe, with the cat muzzle on.